Achieve the look you want for your home with our custom window treatments. 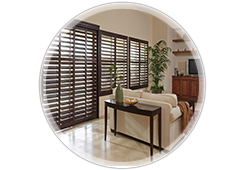 Plantation Shutters and Blinds in Boca Raton, Florida, offers a variety of products—from warm woods and dramatic fabrics to contemporary aluminum. Weather you want to control light, add privacy, or decorate your home, we have the best product and selection for you. We recommend Norman Shutters due to the superior structural assembly and the piano grade finish on their products. You can select from Faux wood, Painted, or Stained wood finishes. Each product will be custom made to your window specifications. We will guide you in selecting the proper product and color for your application, while making the decision as painless as possible. 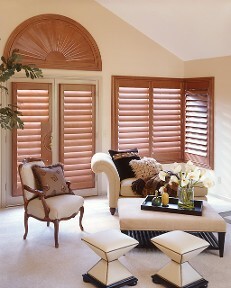 Today's shutters are installed on any window and in any decor. They are timeless in their appeal and are both esthetically appealing and energy efficient. Plantation Shutters are also considered a capital improvement to your home. Options include Sliding Panels, French Door application, Bifold, Cafe', and new for 2015 is the Bifold 180 which places the panels flat against a wall rather then projecting into the room. 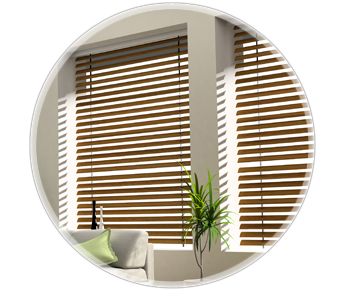 Today Horizontal blinds are a very popular treatment. They are extremely affordable as well as an excellent controller of light. We offer blinds from our private label brand, Hunter Douglas and Graber. Sizes and material options are many. The most common are 2'' wide slats in either faux or real wood. They are also available in 1'' and 2 '' aluminum, vinyl and fabric covered slats. In addition to blinds we offer Shades. Our product line includes Sunscreen, Traditional Rollup, Woven Wood, Sheers and Honeycomb. We truly are your one stop for all affordable window treatment needs. Call us for an estimate, and we will go to your location to take measurements. We will also help you choose the right product based on your goals and budget. We offer this service free of charge. When your product arrives, our professional staff will be there for the installation and will ensure your satisfaction. We are glad to assist you year-round, whether it's for the holidays or for occasional updates. Contact us today for appointments and other inquiries.